A note to our readers today . . .This past weekend our sitemeter rolled over the 4 million mark and to commemorate this milestone we decided to do a surprise draw of our weekend commenters. We would like to congratulate . . .
Ummmm. I love it with potato soup, and bake mine in a hot skillet, too. And it's good with jelly! So... Chrissy, would you please email foreverythingaseason@gmail.com to leave a mailing address and we will get a Mennonite Girls Can Cook cookbook out in the mail for you. This is such a quick and easy recipe to make, it is ready in minutes. Put about 1 tablespoon of olive oil into a saute pan. Add the chopped onion, mushrooms and garlic and cook until softened. Into the same pan add the frozen green beans, and steam fry by adding a couple of tablespoons of water until a bright green and cooked through, stirring often. It helps to put the lid on for quicker cooking but you need to stir for even cooking. If the pan is getting dry add 1 or 2 tablespoons more water to help steam the beans. After the beans are cooked through and the water has completely evaporated add 2 tablespoons or a little more dressing to taste and serve. 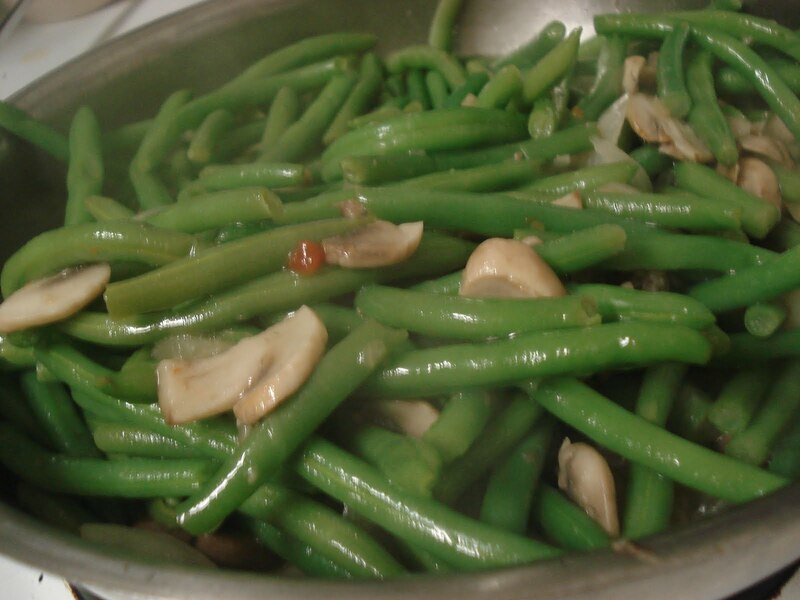 It adds a punch of flavor to plain green beans and dresses up a meal. Sounds great, thanks for this varient on greenbeans!! At a late Christmas celebration in January, each of my four sisters-in-law received your wonderful book. They were so thrilled! This looks great. I'm always looking for simple ways to jazz up veggies to serve my family. Your green beans look delicious. I was wondering where in Kamloops I would be able to buy your cookbook. Years ago my mother bought all of us girls the Mennonite Treasury Cookbook and I thought it would be nice if I could give each of my sisters an MGCC cookbook. Thanks for all the wonderful recipes I use many of them over and over. my mom makes these but with bacon and without the dressing. yummy! Jackie...My friend in Kamloops tell me that Chapters at Aberdeen Mall has a few copies. If you can't find them at a bookstore...they are easy to order from Amazon.ca (delivered to you door). Hope that helps! Congratulations one and all! 4 Million hits. Imagine. You have blessed my lives with your generous contributions. Thank you. So glad I am some of the 4 million. 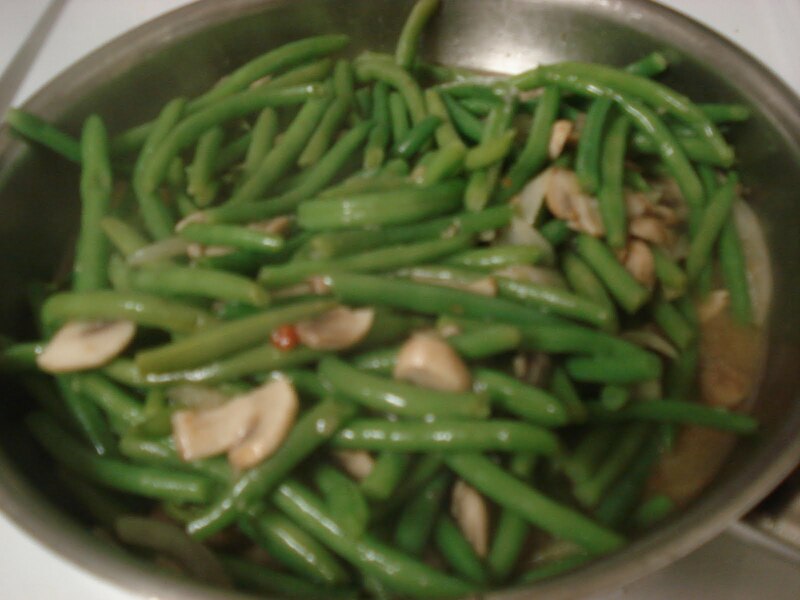 The green beans look so good but I have never had success with frozen green beans. I will try this recipe soon and let you know. BTW - Congrats on your mild stone. I just found your blog and love what I see/read so far. These look delicious, will definitely have to try this! Thanks for sharing! Girls...congratulations on this milestone! Continued success! Maybe this will be the green bean recipe I can eat. I love all kinds of greens, even some most people find kind of gaggy. But I just don't like green beans! The mushrooms should help. I hope. They look so good, and are so nutritious. Congratulations on 4 million hits. I first came across your site by accident whilst looking for Mennonite Recipes to pass onto my daughters. I really love this blog and check in daily. Thank you for such a wonderful and thoughtful blog. Oh, and I love my beans this way too!